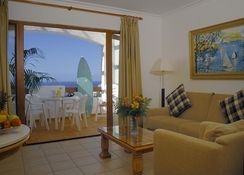 Nearly 250 studios and several suites make up the Suites at Beverly Hills Tenerife in Los Cristianos. This is a resort that complements the offer of comfortable rooms with facilities where guests will feel away-from-it-all. Guests can relax in the pools and its large area of ​​palm trees and gardens for sunbathing or having a snack at the outdoor bar. The apartments have a private bathroom and a well-equipped kitchen; they include towels and linens. Indulge in leisure at The Suites at Beverly Hills Tenerife that can be completed with a game of tennis, squash or bowling, or in a gym session without leaving the hotel. The town of Los Cristianos, in the south of the island of Tenerife, is home to The Suites at Beverly Hills Tenerife. At the foot of the mountain of Guaza, the beach is only five minutes by car from the establishment. Other points of interest are the town of Adeje – at 11.2km, or El Médano at 20km, famous for its beaches and waves conducive to surfing. The Tenerife South Airport is at a distance of 14km from the hotel. 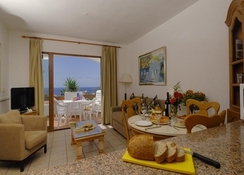 Guests can choose accommodation according to their needs. 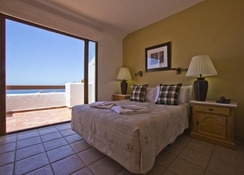 The accommodation here is categorised as Studio Suite, Junior Suite, Duplex Suite and Superior Suite. The guestrooms are spacious and come with a full bathroom including a hair dryer and the kitchen equipped with coffee machine, microwave, toaster and kettle. The balcony or terrace, depending on the apartment, gives a great luminosity to spaces decorated with taste. The Suites at Beverly Hills Tenerife hosts a restaurant and a bar. Guests can also sample delicious snacks at the snack bar. The hotel provides a wide selection of dishes for in-room service. The hotel also facilitates you cooking in your room with a fully equipped kitchenette with all modern facilities. The comfort of staying in an apartment increases when a resort includes spaces for rest and leisure. In this case, it should be noted the large terrace with two lagoon-style pools surrounded by palm trees and gardens; a place of relaxation that is complemented, for sports lovers, with facilities for squash and tennis, as well as a gym area with several possibilities. On the other hand, you can relax in the nightclub and in the bar, open-air and with breakfast and snack service. We went on a couples holiday and opted to stay at the Beverly Hills suite as we read great reviews. Needless to say we had an amazing 7 day stay. The reception staff were so friendly and helpful. We arrived at night and checked in smoothly with no problems. As we were hungry and missed dinner the kind gentlemen at reception gave us take away choices and after deciding was nice enough to order us the food at reception and all we had to do was come down to reception to pick up the food. The food was so delicious, It was the best kebab meat I’ve had thus far! The hotel has lots of options for all ages and is super family orintated, the hotel ran fun events every other day for everyone to enjoy. There is two swimming pools that can be used with amenties of fresh towels and comfy sun lounges, along with table tennis, pool table as entertainment and a pool bar and food available to order for refreshments. There is a small shop within the complex that was handy when you needed to buy extras needed. We booked a studio and it was absolutely spotless and spacious inside. The television had British channels which was great when having breakfast and dinner. The kitchen had almost everything we needed as we cooked most nights. The cleaners would come after 11 to sweep and mop and give us clean towels and bedding. We had two single beds put together in the bedroom and a sofa bed which was super comfy. The only part we felt difficult was walking up “heart attack hill” when it was super hot outside but we loved it as it kept us fit. There is so many lovely bars close by and the staff were all friendly too, bonus. We had to go to the airport in the evening and as we had to check out at 12 we were able to leave our suitcaes in the baggage area and was told we could still use the swimming pool and if we needed a shower after we could use the spa facilities . The complex looks so beautiful and in the morning and we had beautiful views of the mountains from our balcony view. Over all it was a beautiful hotel and they should be so proud of their employees hard work because they were all first class. The hotel was walking distance from the beach and a quick bus journey to the other cities. The whole experience was a great value for money. Let’s just say we are planning to go back next year to Tenerife and we will definitly be checking into the Beverly Hills suite. Very average in all aspects not bad but not great either get what you pay for I suppose. I had not one fault with this hotel staff were great and the hotel was lovely and everything you could want in your room and the reps at reception was great nothing was too much trouble for them . The hotel was very clean, well presented. Staff were lovley, pools area's nice and clean. Room facilities were excellent, everyrhing that needed on a two week holiday. Had a fabulous holiday at the hotel.